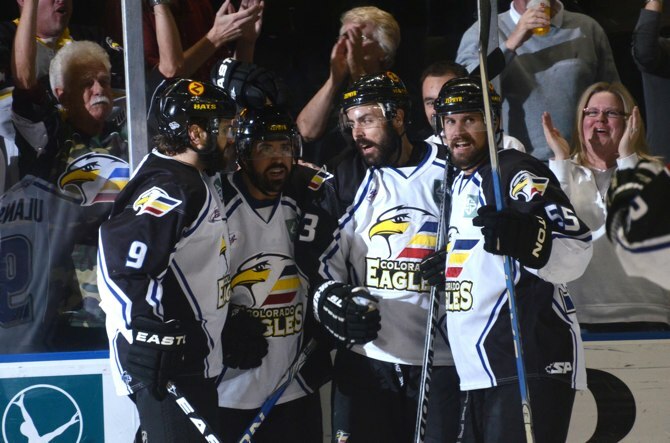 LOVELAND, Colo. – After losing 7-2 in Game 5 of the Central Hockey League’s Presidents’ Cup Finals, the Colorado Eagles took Game 6 over the Bossier-Shreveport Mudbugs, 8-1. Not only did the win force a championship-deciding Game 7, it marked both the most goals ever scored by the Eagles in a playoff game & their largest margin of victory in a playoff game as well. The Mudbugs out-shot the Eagles 10-8 in the first period, but it was Colorado that took a 3-0 lead into the first intermission on the strength of two special teams goals. Scott May started the scoring at 2:41 when he skated off the left mid-boards and snapped a shot past Ryan Munce from the left circle. Colorado made it 2-0 at 14:40 with a play off the right wing wall. Adam Chorneyko entered the zone on the wing and dropped a pass to Riley Nelson. The Eagles’ captain then found defenseman Aaron Schneekloth, who weaved his way into the slot and beat the ‘Bugs’ goalie top-shelf. Then, at 16:53, just 10 seconds into Bossier-Shreveport’s second power play of the period, Nelson sped down the right wing and pulled up deep in the Mudbugs’ zone. He then found Kevin Ulanski all alone in the high slot for a shot past Munce. With that goal, John DeCaro replaced the starting netminder after the former had stopped just four of seven shots in under 17 minutes of action. Just as the ‘Bugs had done in Game 5, Colorado grew their lead to 5-0 before the visitors put the puck in the net. Chorneyko made it 4-0 at 2:48 of the second stanza with a power-play goal from the top of the right circle, beating DeCaro with the help of a screen in front. Exactly two minutes later, the Eagles made it 5-0 — with their 11th shot — when Jason Beatty’s drive from the left point was deflected by Daymen Rycroft in the slot, bouncing down and beating the Bossier-Shreveport netminder along the ice. Shortly after that, Colorado was awarded a five minute power play, but was unable to add to their lead. And at 12:32, the Mudbugs got on the board when Steven Crampton put home a rebound off a Brett Smith shot. At 9:54 of the third period, Ulanski, Nelson and Chorneyko teamed up again to make it 6-1 for the home team, when Nelson found Chorneyko wide open in the high slot for a tally from between the circles. And at 17:44, May picked up his second goal of the game by backhanding a Kyle Peto rebound past DeCaro with the teams skating 4-on-4. Less than a minute later, Chorneyko became the second Eagles player to pick up his first career hat trick during the 2011 playoffs (Steve Haddon) when the rookie made it 8-1 on a breakaway. Game 7 will be played Friday, May 27 at the Budweiser Events Center, starting at 7:05.